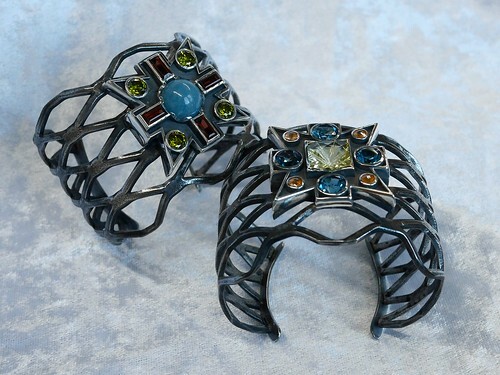 Some of you who follow my blog or who pick up on it occasionally may remember that in May, I completed a pair of Verdura-inspired cuffs to a specific commission from a customer. I was extremely pleased with the result of the cuffs (above). "The bracelets are beautiful, even more wonderful in person than in the photos. I absolutely love the stones, especially the yellow/orange/blue one. The finish, craftsmanship, artistry are everything I hoped for and more. Thank you! "There is one big hitch, though - they are very big on me. I don't mean scale-wise, I am happy with the scale, but they are just way too large for my wrists. To have them fit snugly I have to push them halfway up my forearm and then they are still wider than my arm at that point. "Please advise! I am guessing I will need to send them back to you for resizing. I went back and double checked the wrist measurements I sent you back on 1/14, and they are correct. I do have particularly skinny wrists." I re-sized the bangles and sent them back to her. 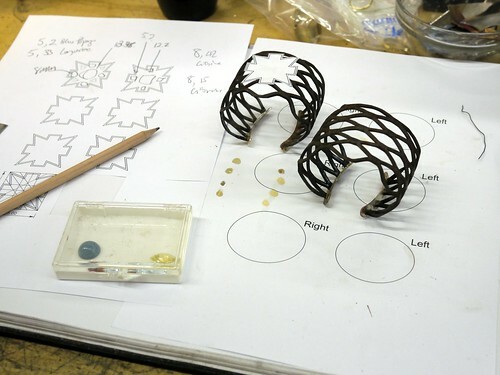 By pure chance, one of my students looked over the bangles before they were sent, and I discussed with him the issues of resizing a piece like this. The bangles were also checked before packing by the wonderful Andrew at Mailboxes Etc. - whom I use to do all my shipping as they understand all the subtleties of customs and shipping - and so I know that they left me in pristine condition. My client claims that they arrived damaged with one of the medallions detached from the bangle. I received no photograph of this damage. She refused to contact the shipping company. She claimed that I should take the whole lot back and refund her money. Needless to say, I declined. This is where PayPal get involved. My client had paid PayPal with her credit card, three separate payments: a deposit, a balance and the charges for the customs disbursement. She claimed them all back from her credit card company who claimed these back from PayPal; PayPal immediately charged me for this without giving me any warning or explanation - I had to trawl through the website to work out what was going on. I contacted PayPal and gave them the details of what had happened and they told me that they would send the details onto the credit card company and invited me to call with more details, which I did. I was told by the fellow on the phone that I wouldn't have to pay anything until the credit card company had dealt with the issue and that they would ensure that the bangles were returned to me before any money was paid back by me if it came to that. Then they started to call me. Not once, but repeatedly. It seems that I had been given "incorrect information" and that I would be "continually called until payment is made" - in short, harrassed. I was told that I could not see the correspondence between PayPal and the credit card company and threatened with "a collection agency". They called me every day for about a week, until such times as the inevitable happened and the credit card company found in favour of the lying cheat who is also now in possession of two of my bangles. I am out of pocket to the tune of the materials and time. Looking online, there are so many complaints about PayPal that it is a wonder that anyone signs up with them. I have closed my PayPal account and, on the back of that, my Ebay account. For various reasons, Paypal being one of them, I have closed my Etsy account and am now on the lookout for a viable alternative for selling my work online. I am hoping to bring it all aboard a new website using a reputable bank-based payments system which is regulated by government bodies, as opposed to an unregulated company like PayPal. If you ever see those bangles being worn, please take a moment to tell the wearer exactly what you think of them. Carolina, dress size is an interesting one! I hadn't thought on that. I am not put off at all and will continue to do international business. I don't get charged for receiving money but the buyer gets charged for sending it and on a $100 transaction, of which I have done more than a few, the charges would be about 25% of that, which makes it very expensive. I don't like to specify that custom work is not returnable or refundable as customers often like - very reasonably - "tweaks" to work and I don't mind doing that. Mostly they are happy to pay for the shipping. Linda, I do actually have a Ganoksin account but have not been on there for years! I will dig out the details and do that. Thank you. Please send images of these bracelets to the ganoksin.com forum, Orchid Forum, so that jewelers around the world will know about this scam by the customer and the difficulties you have experienced with paypal. Ginny, many thanks. I can assure you that the post was wholly cathartic and I am already onto my future projects! I am not one to dwell on setbacks and the words of encouragement I have received from so many people have put the whole thing in perspective for me. I've done my bit, done what I can and it is "Onwards!" for me. Victoria, I am interested to hear that PayPal have found in your favour in similar circumstances: they do get a very bad rap online but there seemed to me to be no option at the time. In a sense, it is all my own fault for not selecting a more reliable method of payment. My very best customer does direct transfers to my bank for the work she buys from me and if there were to be any problems subsequent to that transaction, it would be an issue which would have to be sorted out wholly between ourselves. As to lawyers, the main problem is that I am in the UK and sold under UK law, while she is in the US and bought under US law... where that leaves us, I do not know and I cannot really afford to lose any further money on speaking to a lawyer. Even an informal consulation would cost me about 1/6 of the money I have already lost. I don't want to embark on any big campaign of negativity. I know that my social networks are behind me on this one! How awful! I'm so sorry you went through all of that. As long as credit card companies want to keep their customers happy (and they have a lot of competition to do so), we will all face these risks no matter what type of gateway we use to accept the cards. What happened to you could happen again with any of the gateway options, shopping carts, or ecommerce options. Ultimately, the credit card companies get to decide. Although I've been fearful of PayPal's bad rep, they have decided in my favor both with me as a seller and a buyer. For the past 8 years I've had great experiences with them. I've given up on Square. Their card readers continually break, leaving me to key in credit card information in person at a significantly higher fee. Square has refused to refund the difference in manual and swiped entries even though their card readers are the problem. I'm not a lawyer, but having navigated similar issues, presenting proof of your photos and emails with the client to the credit card company should have gotten them off your back. Beyond that a letter from a lawyer outlining the scenario and the proof you have should also have gotten them off your back. Most states have organizations for artists to receive free legal help in these types of matters. Companies will often back down when threatened with the cost of litigation. Finally, shaming helps. You might put images of the cuffs with a watermark "Stolen" all over social media. If your network is big enough, at the very least it is possible to make the customer embarrassed to wear them. Square seems to work for most people and I see that there are now similar services in the UK. These do not, however, allow the seller to take "card not present" transactions, which I would need to do for overseas orders. I was so completely unsupported by PayPal - who were only interested in making sure that they got their money - that I will not trade with anyone who does not offer me a different option. E-junkie does have other options but I can't see how that can protect you beyond what PayPal terms and conditions offer (precious little for the seller, I can assure you). http://www.e-junkie.com/ shopping cart for years, but I'm thinking that doesn't protect me. I've never had a problem with either, and I have a Square -no problems...but geezzzz I guess I'll have to get smart on this. Thanks so much for posting. I'll be looking for those bracelets too! Sophia, Etsy is a slightly different issue for me as they do have their own payments system (although their dispute resolution policies are laughable) and my main complaint is that my work doesn't fit in with the rest of the work on the site. I don't feel the site commands the respect I would like it to have. It was probably wrong of me to mention Etsy in the context above as I've been thinking about closing that account for some time now. In terms of alternatives, I will not deal with any company which offers to support PayPal in any form. They have blown it completely as far as I am concerned. Since posting this, however, I have now had so many options offered to me, including your most recent suggestion of 11Main.com, of which I had never previously heard. I will be making a further post with a review of the suggestions (WorldPay, NoChex, Square, BigCartel, plus the option of creating an e-commerce website myself). So sorry you went through this, Dauvit. It seems inevitable that we will all experience a case like yours in the long run. I have been struggling with a similar case and I have been having negative thoughts about Etsy and the way they do business, although they found in my favor. I have relocated my website and my $500 and above pieces to Shopify (it is not necessary that you use the PayPal option) and I have tentatively listed some items on a new platform called 11Main.com, recommended by some IT friends. Will keep a look out for those magnificent bracelets. Kimberly, many thanks for your support. It only takes a moment on a search engine to find all manner of horror stories with people losing enormous amounts of money. It seems that PayPal NEVER find in favour of the seller, probably because it is easier and cheaper for them to run things this way. When you look at the small print - and, as ever, I didn't read it until too late - you realise that the odds are firmly stacked against the seller. It is almost impossible to win against them, even when the claim is so blatantly false. I would have thought that PayPal or the credit card company would have demanded photographic proof of the damage to the item but her word was sufficient. PayPal never even suggested to her that she contact me or the shipping agent or that she seek any number of other possible solutions to the issue: they jumped straight for the easiest one and the one which would make them the most money. Deborah - I will be making a post when I've found a valid alternative.